When searching for the best beach to visit in your travel destination of choice -- be it Spain or Croatia or Puerto Rico or even Michigan -- you want to consider what’s really a beautiful beach, and what’s just a beautiful beach that looks like every other beautiful beach. The world has many beautiful beaches! That doesn’t necessarily mean they stand out. The best beaches aren’t just great for swimming or surfing or sunbathing, but show you something new, and have that extra special oomph. Take Portugal for example. 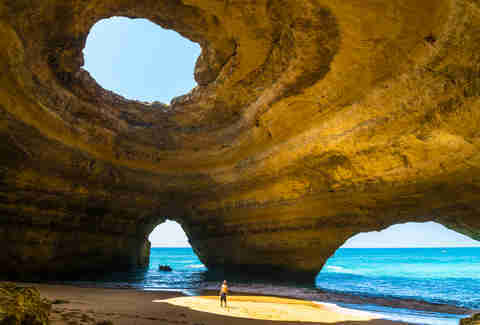 Its coastline is riddled with sea caves and grottos and fantastical rock formations. It’s also one of the best regions in the world for surfing, both amateur and competitive. 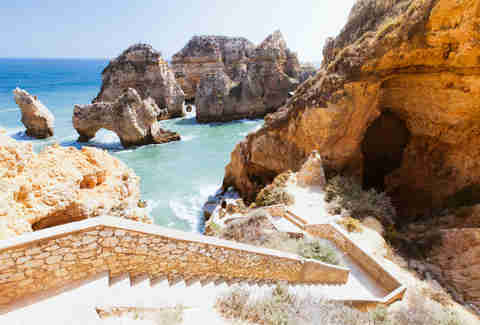 So if you’re a fan of snorkeling and exploring secret coves by boat, get thee to Portugal. Here are the most gorgeous beaches to see while you’re there. Praia de Benagil itself is a stunning beach, set against golden cliffs and popular among both tourists and local fishermen. The truly spectacular draw, though, is the prospect of exploring the nearby sea caves, which you can reach only by boat. Set aside a couple of hours for a tour led by one of the aforementioned fishermen; it’s one of the best things you can do for yourself while in Portugal. Bonus: Try visiting in the morning to see fishermen hauling in the catch of the day. A short drive from Praia de Benagil lies Ponta da Piedade, another spot that is best explored via fishing boat tour. Your guide can take you through the winding rocky coves -- don’t worry, it’s safe -- and potentially take you snorkeling, depending on the parameters of your particular tour. Aim for a boat on the smaller side, which will be able to navigate the smaller, more secret passages between the rock formations that your fellow tourists on the bigger boats will miss. Bonus: If you’re willing to climb 182 steps, the view that awaits you atop the nearby lighthouse will make you glad you did. Don’t worry, we’re going to get into some lounging-in-the-sun beaches, too. 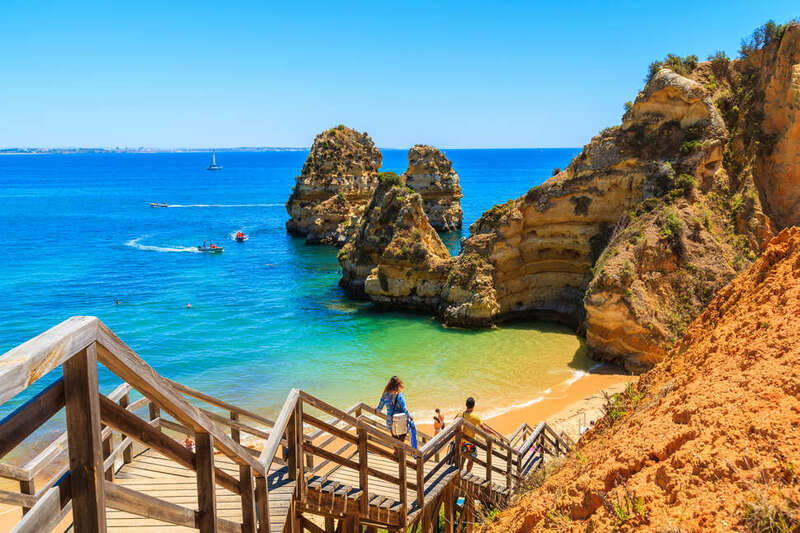 Praia do Camilo -- which is actually not one but two beaches, connected by a short tunnel -- lies at the bottom of a 200-step wooden staircase, the only thing to say about which is that it is worth the climb. Expect it to be crowded if you go during the peak summer season; can’t really blame people, though. This beach is iconic. Bonus: Spend the morning down by the water and then, when you make your way back up the stairs, stop for lunch at the beloved cliff-top Restaurante O Camilo. Oh, does this beach look big? It is, especially at low tide. Nearly two miles long, Praia de Bordeira is beloved by surfers and bodyboarders. But this stretch of sand also makes a great family vacation spot. 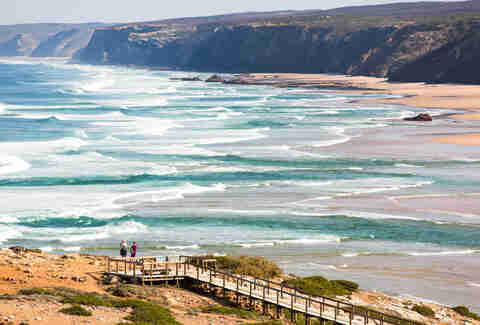 The small Bordeira river will sometimes connect with the ocean to form a warm, shallow lagoon that’s perfect for kids to play in, as are the surrounding sand dunes. Bonus: Want to surf? To the South you’ll find a school and rental shop. Not so much? You’ll find a beach cafe there, too. 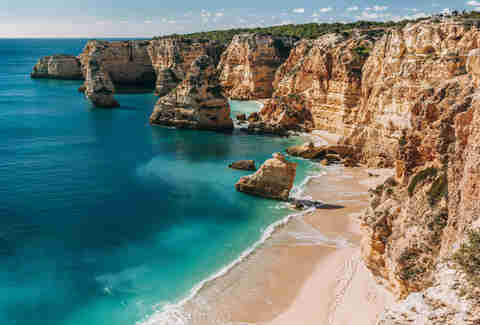 Praia de Marinha looks fully like something that should only exist in, say, The Lord of the Rings. Look for one of the most distinctive rock formations to be found anywhere -- the M. You’ll know it when you see it. The waters are perfect for snorkeling, and this beach is another one where you can explore the surrounding sea caves via boat tour, but you won’t feel like you’re missing out on anything if you just stay on the beach itself and just sort of stare. Bonus: Before you take the stairs down to the beach, check out the walking trail that runs along the cliffs; this is where you’ll get those dramatic views that can only be seen in full from above.